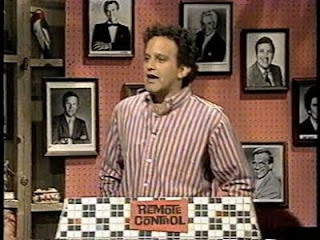 Ken Ober, who hosted MTV's pop-culture-centric game show, Remote Control, for five seasons beginning in 1987, was found dead in his home on Sunday, the network reports. The 52-year-old's cause of death has yet to be determined. "Kenny Ober was and always will be the quickest wit in the room," Denis Leary told MTV News. "He was fall-down funny from the moment he was born — a smart, fast and hilarious human being who made many of us, including myself, laugh until we cried. As the star and host of Remote Control, he was a welcoming ringmaster who helped to kick-start the careers of numerous talents, including Adam Sandler, Colin Quinn and myself. He will be remembered always by each of his friends not only for his massive talent but for his true, deep and enduring friendship." "Ken Ober was one of the sharpest, quickest, sweetest guys I ever met," Sandler told the network. "He was always a great friend and I will miss him very much." Lee Kernis, the star's manager, said that Ober complained to a friend of a headaches chronic chest pain and flulike symptoms on Saturday.